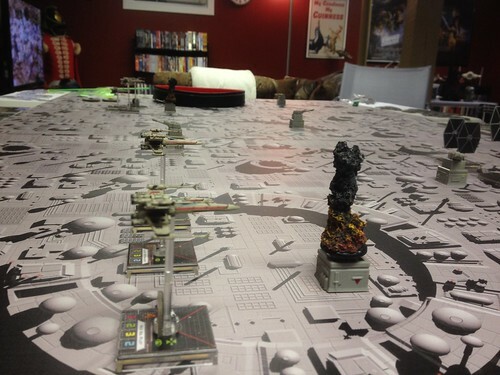 Last Thursday at Dallas' place we recreated the first part of the Battle of Yavin (from one of my favourite movies, STAR WARS), as Red Squadron strafed the Death Star prior to Gold Squadron's attack run. 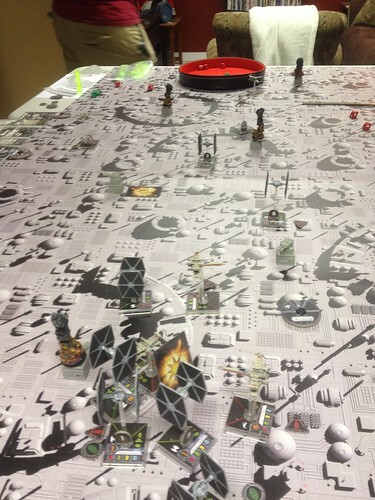 We used two of the Gale Force 9 space station mats to create a 6'x3' Death Star surface. 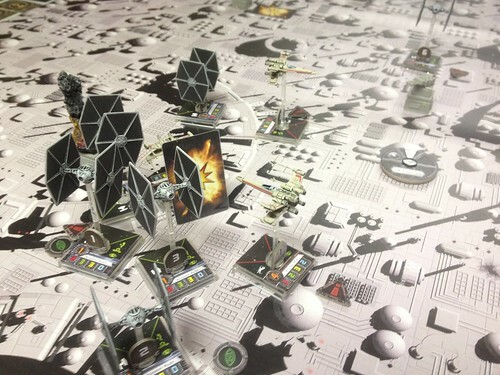 The squad sizes, respectively, were about 200 points for the Rebels; less for the Imperials, but the 6 turbo laser turrets had no points value. I had planned on adding Chewie in the Millenium Falcon with Han as a gunner, and Darth Vader, but I am saving them for an actual trench run game when my resin Death Star terrain comes from JR Miniatures. 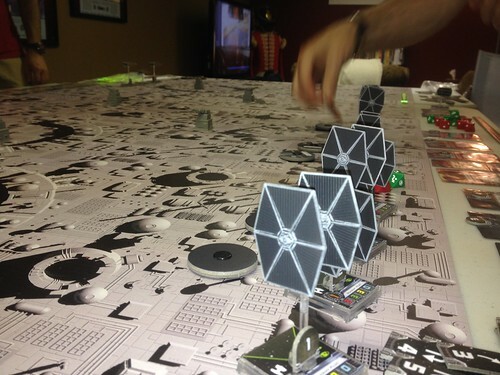 Kevin and Indo each ran a trio of X-Wings led, respectively, by Luke Skywalker and Garven Dries (Red Leader). Dallas and Jim each had 4 TIE Fighters, with Dallas also running the squadron leader, Howlrunner. 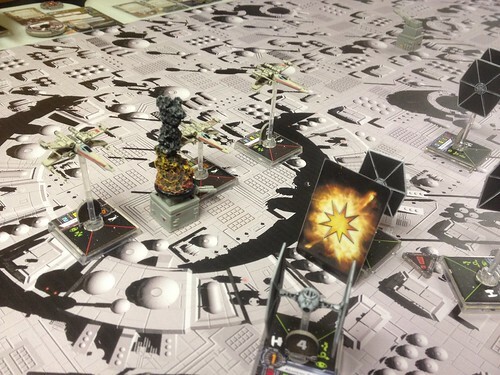 The Rebels had to destroy all 6 turbo laser turrets; the Imperials had to try and stop them. 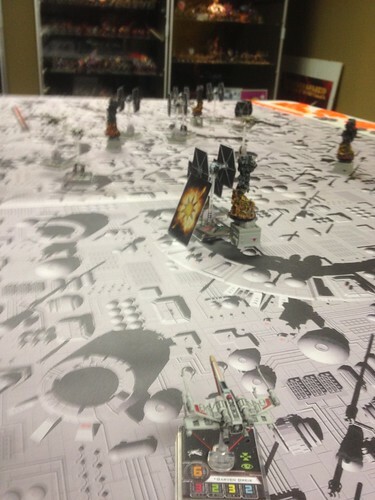 The Rebels set up across the the board, to reach all the turrets. First turn, the Rebels dove into the fray and destroyed two turrets! Luke and his buddies then flew past a turret, and shot down one of Dallas' TIE fighters. In response, Jim and Dallas ganged up on Luke, shooting him out of the sky! Meanwhile, Indo nailed a couple more turrets, unmolested by the Imperial fighters. Indo moved to join the fur-ball. 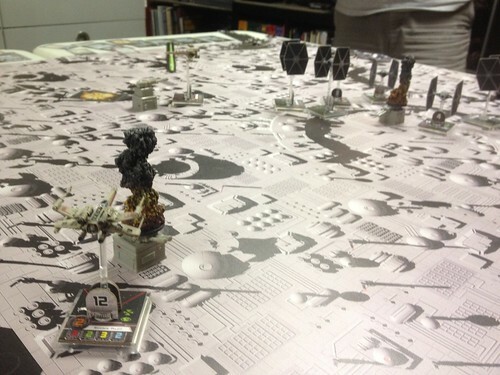 Kevin and Indo's X-Wings concentrated their fire and destroyed the last of the turrets. As Kevin later pointed out, it took the better part of 8 TIE fighters to take Luke out - allowing the Rebels to WIN the game! Luke will probably be back for the actual Death Star trench run. I shall treat it as a "script re-write"; who the Imps THOUGHT was Luke was actually Jek Porkins. Also, Gold Leader's Y-Wings, Darth Vader, and Chewie & Han Solo in the Millennium Falcon will all be at the party. As always, a fun game! Thanks Dave. 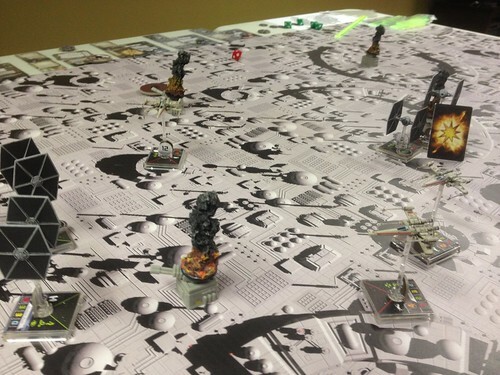 That play mat is amazing! Very Death-Star-like, and it really has that "harsh unfiltered light of space" look about it. 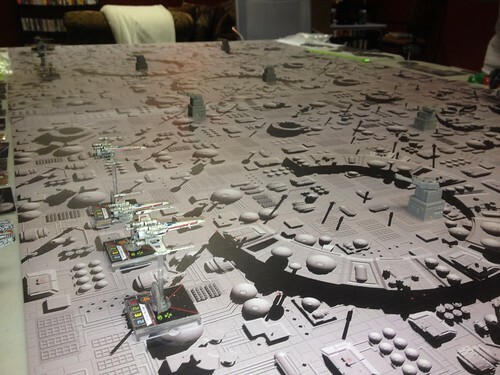 That 3D terrain Kickstarter looks really nice but pricing is kinda nuts... $250 for the whole set? It's worth it but you'd *really* have to love re-playing the Death Star battle to shell out for it. Great board, great game and the good guys won too! 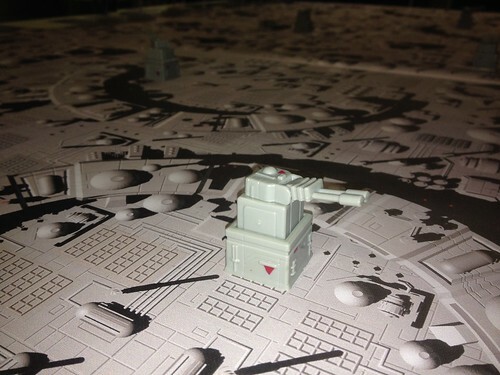 I could afford to purchase enough Death Star tiles to create a 4'x3' playing surface (with a 4' long trench), and some accessories like a turreted tower, another turbo laser turret, and the auxiliary exhaust port (the target) itself. I've seen Star Wars maybe 40 times; I wish this game had been around when I was a kid. I figure we can amortize the use of the JR Miniatures terrain at future game conventions, too. Great looking game guys - well done. Cracking looking game, the board really makes it. I checked the Gale Force 9 web site, and their space station gaming mat is no longer offered. Instead, they have another two star field mats. 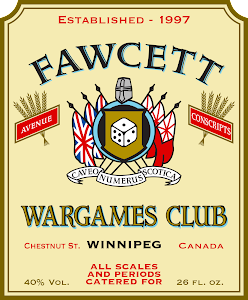 it's now 8 feet of trench, three turrets, and 2 turreted towers. Egyptian T-55 Tanks for "Fate Of A Nation"
Sedition Wars Project - First Blood! 15mm Egyptian IS-3 Company for "Fate Of A Nation"